This is a monthly subscription, see details below for the Graphic Tracer Professional product. Click your way through the tools of Graphic Tracer and in a few simple steps you will have recreated the graphic to its original look. You will get perfect graphics that can be used for any purpose. The active help system provides you with instructions for the current tasks. The original image is displayed in the background making editing easy. Easy to use tools make perfect arcs, lines, curves and corners. Symmetrical shapes are quickly fixed with five different mirroring tools. The identified font is projected on top of the graphics to ensure that it is a 100% match. Fonts that you don't own can be quickly located online by Graphic Tracer. Over 20,000+ fonts can be downloaded for free. If you own the font, click the "Replace" button and swap the text in your image with the correct font. Graphic Tracer can recognize typefaces even if the text has been stretched or compressed. Identify over 100,000 fonts! Search any font collections you own, even when they are not installed. Fix common shapes, repeated objects and outline effects with a click. GET PERFECT TEXT WITH ONE CLICK! Do you spend too much time trying to figure out fonts? It can take hours and many times you won't even find the answer. Everyone working with graphics has this problem. Graphic Tracer automatically identifies over 100,000 fonts from a variety of font collections, and 20,000+of them can be immediately downloaded for free from the Internet. If you own the identified font, you can replace the text right into your graphics with one click. Instead of spending many tiresome hours trying to get an image ready for production, let Graphic Tracer reconstruct the graphics to it’s original condition. Texts are automatically identified and replaced, contours re-calculated and common shapes can quickly be repaired. Mirrored shapes can be reproduced with a minimum of editing and repeated shapes can be easily transferred to all similar objects– Save Time and Increase Profit with Graphic Tracer! Open or import file formats:PICT, BMP, DIB, TIFF, GIF, JPEG, PBM, PCD, PCX, PGM, PNG, PPM, TGA, AI, EPS, DXF, CGC, IMZ & GT. Sensedge Autotracing™:Gives total control of the bitmap to vector conversion process of color, grayscale or black/white images. Automatic clean up tool:Removes redundant nodes and inserts new ones in the right places. Drawing tools:Circle, ellipse, square, rectangle and pen tool. Guidelines layout:Rulers, grid and "magnetic" guide lines. Bitmap editing tools:Increase or decrease the resolution and edit a bitmap before it is auto traced. Font Database creation:Make your own searchable FontEye™ databases from your own typeface collections or installed fonts. Replace text with the correct font:This feature is only possible using fonts that you own, but they do not need to be installed! Approximately 10 GB of free hard disk space. 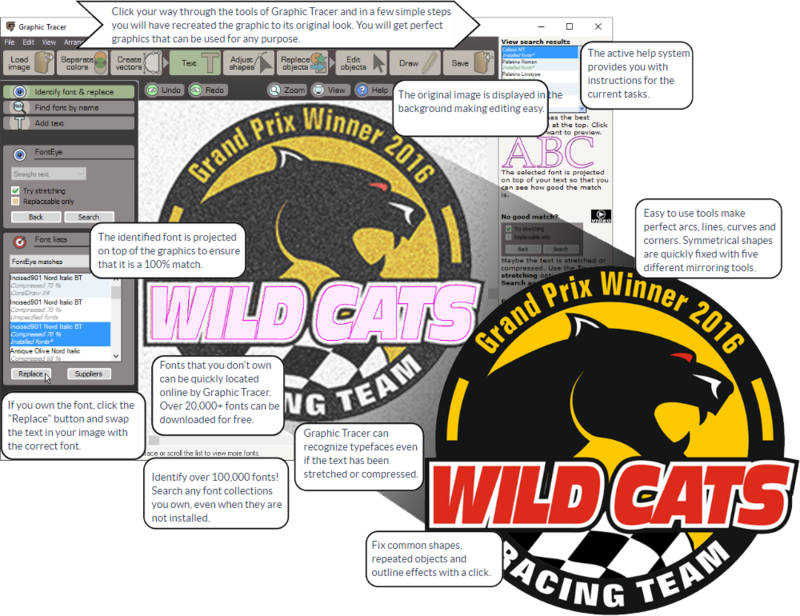 ClikLink™ is a function that allows the user to import or export graphics directly to and from other software. ClikLink™ in Graphic Tr acer currently works with Adobe Illustrator and Corel Draw. This programme has made my life easier and I don't worry about how do I bill all the extra hours of art time.By far the best programme to come along... I use it, I enjoy the time it saves me and like I say "Time is Money". Download your Trial Copy today!